The Ardara GAP Heritage and History Group’s inaugural ‘Warp and Weft of Heritage’ Weekend is fast approaching. 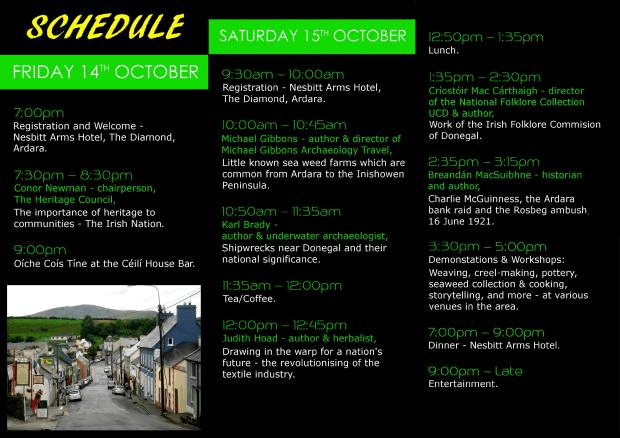 The event runs from Friday, 14th to Sunday, 16th October.There will be eight engaging and lively talks ranging from shipwrecks, sea weed farms, folklore, weaving, sport, archaeology, history and heritage of the greater Ardara area. Also included in the weekend’s programme are a series of workshops, storytelling, demonstrations, field trips and a ‘Bring Your Own Sod of Turf’ storytelling afternoon! Some of the workshops have limited capacity, so booking is essential. The group have also organised evening entertainment as part of this relaxed weekend. For further information check out the brochure, available around the area. Online booking for conference registration is now open and you can contact: ardaraheritagehistory@gmail.com or 087 921 4206. Otherwise you can leave completed booking form and appropriate fees in the Nesbitt Arms Hotel. Other drop off points can be obtained by contacting 087 921 4206. Contact the Nesbitt Arms directly on (074) 9541103 or info@nesbittarms.com to avail of the special weekend offer, quoting ‘The Warp and Weft of Heritage Weekend’. Follow us on Facebook, Twitter and Instagram.